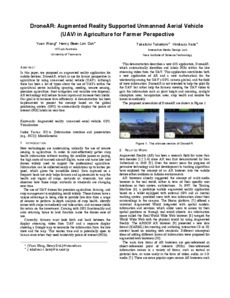 In this paper, we proposed an augmented reality application for mobile devices, DroneAR, which is use for farmer perspective in agriculture by using unmanned aerial vehicle (UAV). Although there has been a lot of types about the use of UAVs within the agricultural sector including spraying, seeding, remote sensing, precision agriculture, frost mitigation and variable rate dispersal, AR technology will reduce farmer inputs and increase their yields. Our goal is to increase farm efficiency. A demonstration has been implemented to present the concept based on the global positioning system (GPS) to automatically display the points of interest (POI) labels on real-time.